Working with other internet media types (e.g. images). Today’s session begins with a quiz. You have some experience working with the JSON and XML data formats. The Images code example enables us to learn about writing our own media type formatter. We’ll use a simple book data entity (books – remember those? ), and configure its entity class with properties that hold a photo of the book cover, and the internet media type of the photo (typically “image/png”). 1. Configure the design model class with properties to hold the photo. You need a byte array (byte) for the photo, and a string for the internet media type. 2. Configure a resource model class with these properties. 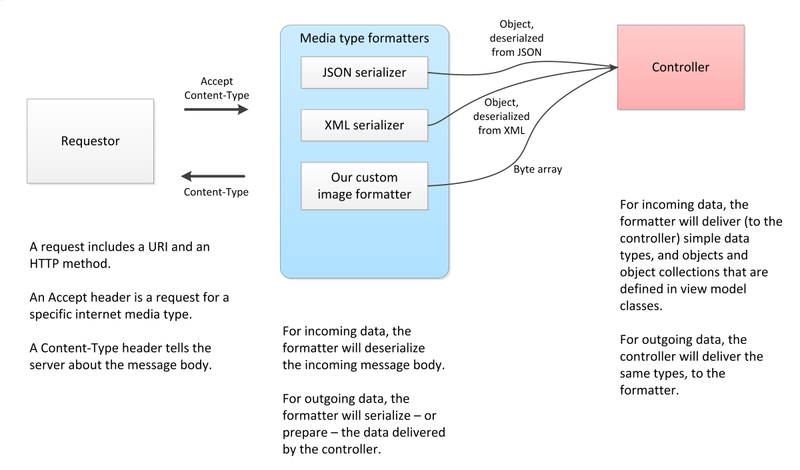 Typically, you will add attributes to make the JSON and XML serializers ignore the photo-related properties (so that the photo bytes are NOT delivered to requestors unless specifically requested). 3. Add the appropriate repository method (e.g. update an object with a new photo). Do NOT deliver image bytes as a property value in an object (or collection). It’s the web! Deliver only the image by setting its content type header. Get and study the code example. Here are some highlights. 2. Configure a resource model class with these properties. Typically, you will add attributes to make the JSON and XML serializers ignore the photo-related properties. The suggested way to do this is to create an interface, which declares the photo-related properties, and then the resource model class inherits from this interface. This feature will enable a future code refactoring opportunity. The existing ‘get-one’ (i.e. GetById(int id)) method already returns a BookBase object. Therefore, it does not need to be changed. An ‘update-existing’ method, that would also remain unchanged. An ‘add-new’ method would accept a BookAdd object, which does not include the photo properties. Therefore, when adding a new book, it will be a two-step operation: 1) First, ‘add-new’, with the basic details, and then 2) ‘set-photo’ to configure the photo. So, the only really new repository method is SetPhoto. Notice its argument list. The current design of the MediaTypeFormatter (and BufferedMediaTypeFormatter) classes do not provide a way to set the response’s Content-Type header dynamically. We need this capability, in order to support a range of popular image formats (JPG, PNG, GIF). Study the code in the ImageFormatter class. All media type formatters are similar, and they are fairly simple. They have a constructor and up to four methods – a pair of ‘read’ methods, and a pair of ‘write’ methods. Note: These formatters work well for small- to medium-sized digital assets. If your asset is less than a few hundred kilobytes, then you can use this design, which is synchronous and therefore blocking. For larger digital assets, use the asynchronous approach, where the base class is simply MediaTypeFormatter. A future example will show you how to do this. For many weeks, we have been learning to design and code a web service by thinking of it as an API to a database-like data store. You have learned how to handle the typical CRUD operations (create, retrieve, update, delete) normally associated with data management. The HTTP methods map nicely to these operations, and that familiarity has helped you make progress. It’s time to expand our thinking, beyond data management. How? By adding the ability to handle commands and operations that may or may not be easily mapped to data management. In most cases, the command will change the (data) state of the targeted resource. Today, and maybe in Lab 5, you’ll get a gentle introduction to this concept. This will prepare you for more interesting scenarios in a few weeks. Assume that you want to do something command-like to a resource. For example, send a representation of the resource by email to a list of pre-configured recipients, and log the action. Or, increase the hourly wage 5% for all employees in a certain department. Or (as in today’s code example) set/save a photo for a resource. CQRS states that a command does something but does not return data to the caller.